Haemanthus is a Southern African genus of Amaryllidaceae, subfamily Amaryllidoideae, with some 22 known species, endemic to South Africa, Namibia and the kingdoms of Lesotho and Swaziland. 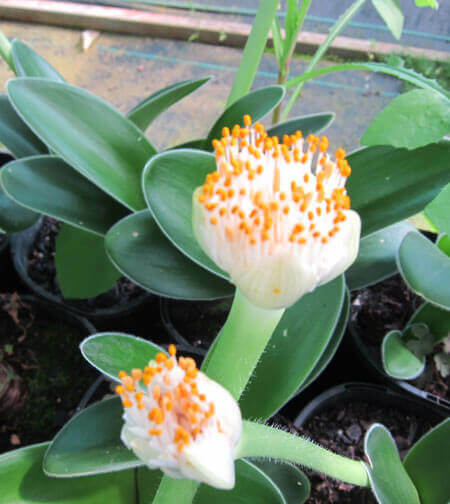 About 15 species occur in the winter rainfall region of Namaqualand and the Western Cape, the remainder being found in the summer rainfall region, with one species Haemanthus albiflos occurring in both regions. Most of the species have brush-like flower heads enclosed in four or more membranous to fleshy spathe bracts which usually match the flower colour and, like sepals, protect the flower heads from damage and desiccation. The flowers produce abundant nectar and pollen and a faint smell unattractive to humans. Fruits are mostly globose and when ripe, range through bright red, to pink, orange and white, and are usually aromatic. The white form is evergreen, with Autumn flowers appearing 30cm above the evergreen foliage.